So I recently purchased my first batch of NYX lipsticks. I ordered them off of a ebay, from a “well known” NYX seller PorkDaisy (link to seller at the end of post). I’ve ordered a few blushes from this seller before, which I always had a great experiences. I decided to purchase the NYX lipsticks after watching reviews and my own urge to grow my lipstick collection (after all, I am a LipGloss kinda gal J). So, I went ahead and purchase 6 NYX Round Lipsticks for $10.95 (+2.68 for shipping) Great Price! Especially since the going rate for these lipsticks are about $4.00 each on the actual NYX website. So I pretty much paid less than half price!! 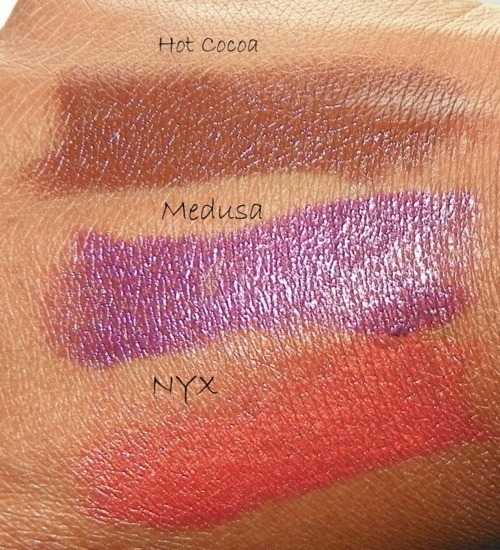 Anyway, back to the Haul…the colors I decided to get were: Fire, Chole, Shiva, Medusa, Hot Cocoa and NYX. Fire is almost like a Neon Red color. Chole is a satiny pinkish color with purple undertones. 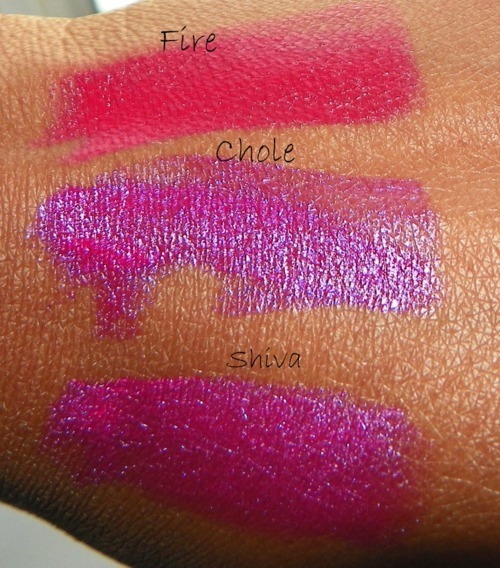 Shiva is a fierce hot pink color. Hot Cocoa is a simple matte brown. Medusa is a dark purple. Plumish…LOL I made up that word! NYX is a firey orange color. I am really looking forward to using all of these!! If I have to choose SHIVA and MEDUSA are my FAVS!!! Keep an eye out for my accompanying video!